Where there were once so few Galapagos reading options, today there is a wealth written about the islands, their history, geology and remarkable flora and fauna. Following are a few of our favorite titles which you should be able to find through your local bookseller or on line. The yachts we charter for our workshops also have a reference libraries on board, including bird and fish ID books, books on the flora of Galapagos, as well as some of the human history. The essentials of a “how to” travel adventure to the Land of Darwin are now available in this comprehensive book. Entire chapters are devoted to such topics as choosing a tour, what to pack (and not to pack), Galápagos history, wildlife (with an orientation towards photo opportunities), and a detailed tour of the islands. 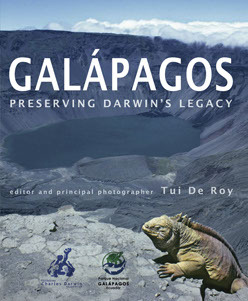 We give this book to everyone joining one of our Galapagos workshops! 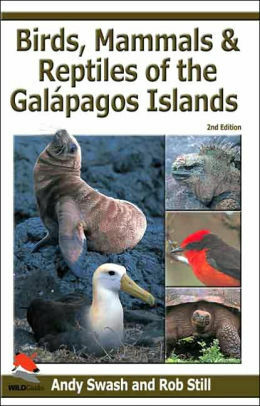 The most complete identification guide to the wildlife of the Galápagos. This book covers over 200 commonly seen species including birds, mammals, reptiles, invertebrates, plants, and coastal and marine life. Illustrated with over 400 color photographs, maps, and drawings. Includes information on the history, climate, geology, and conservation of the islands. There is even a section offering tips on photography in the Equatorial sunlight. Written by wildlife experts with extensive knowledge of the area. The 53 composite plates, composited from 500 photos, enable the reader to identify each animal with confidence - especially the land birds and shore birds, which can be somewhat tricky. This pocket guide is a must-have for anyone visiting the Galapagos with an eye towards the land birds. Fully illustrated with over 250 photos. 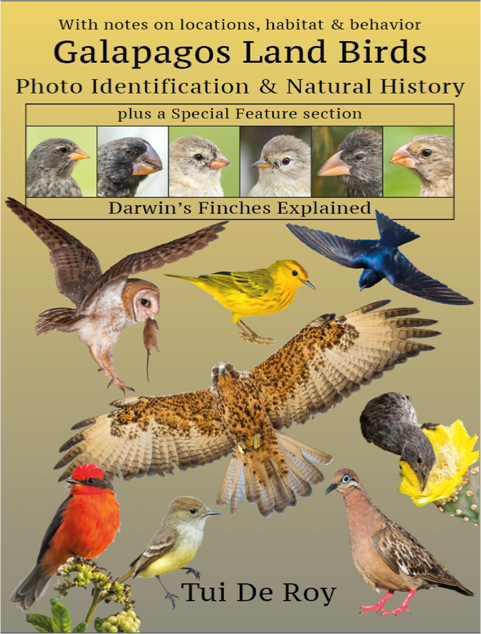 Nowhere else is there such a concise description of Darwin's Finches and where they are found - perfect for knowing exactly who you are seeing on the trails! Watch for the upcoming companion book on the Galapagos Sea Birds. Tui de Roy corralled researchers and friends for this stunning survey of the natural history, ecology and conservation of the Galapagos. With over 450 breathtaking color photographs and chapters by Jack Grove (fishes), Peter and Rosemary Grant (finches), Dennis Geist (geology) and many other scientists. The wide-eyed tale of a young man on a five-year voyage that changed his life -- and our way of thinking about the world. First published in 1839, it is still a marvelous introduction to the wildlife, nature and allure of South America. Galapagos Birdwatching is not only for serious birders but for anyone that want to know more about the birds seen on the islands. Residents, migrants and vagrants, introduced, cultivated and even hypothetical species are discussed. Looking for birds is made easy with a list of species seen in the regular visitor sites of Galapagos. Identification can be done with the help of photographs, chosen to point out the distinctive features of a bird. The companion eBook GALAPAGOS BIRDLIST is a handy list of what you might be seeing. Rescuing an important expedition from the footnotes of history, this readable science book tells the story of eight scientists who, in 1905, collected staggering amounts of specimens from the Galapagos in an attempt to test Darwin's theory of evolution. Colorful early settlers including Dr. Ritter, Baroness Wagner von Bosquet and her three lovers and sturdy Margaret Wittmer enliven John Trehorne's riveting, real-life tale of murder in paradise. This book is the rough basis for the 2013 major theatrical release by the same name. 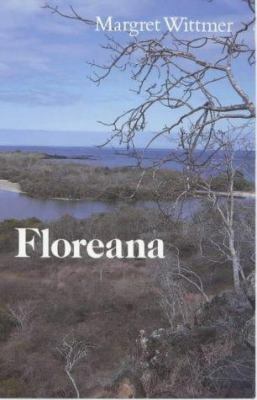 Highly recommended, this is the only comprehensive yet compact guide to the flora of the Galápagos. The plant key is very easy to use in the field, making identification a relatively simple process. The book is extremely well organized, has well-written descriptions and excellent photographs, and covers many of the exotic (introduced) as well as all the indigenous (native) and endemic plants. This guidebook will familiarize you with the fishes of the Pacific coast, including the Galápagos Islands. Each species is shown in full color with a thorough identification as well as behavioral traits. Compact enough to take with you and use as a field guide, the book also illustrates the differences between juvenile, adult, and breeding stage of the same fish. This comprehensive, easy-to-use guide is an excellent source for identification of Galápagos marine creatures. In addition to dozens of photos, the guide offers information on behavior, distribution, distinctive features, and different phases of Galápagos fishes, as well as an index to marine mammals and reptiles. 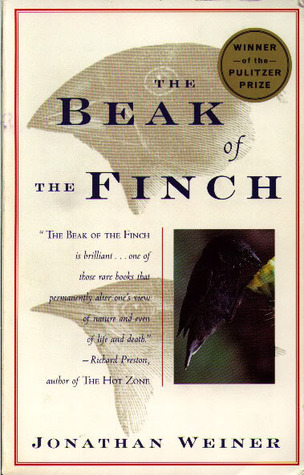 There is usually a race for this book after a Galápagos snorkeling session "to see what we saw." Related in-depth titles include A FIELD GUIDE TO THE SEA STARS AND OTHER ECHINODERMS OF GALAPAGOS and A FIELD GUIDE TO MARINE MOLLUSCS OF GALAPAGOS, both by Cleveland Hickman. We've used a lot of whale identification books, and this is by far the best. The illustrations are numerous and are incredibly well done. There are even drawings of action sequences, including breaching and diving, which help in the identification. Often, there are squares showing color variations, which are also quite useful. While cetaceans are not usually the highlight of a Galápagos trip, this book is highly recommended as a guide to whales throughout your world travels. Volume II, the field guide volume of this two-volume set, contains 96 full-color plates and facing pages of descriptive text, a color map of Ecuador, along with two line drawings of bird anatomy, 115 silhouette outlines, and nearly 1600 distribution maps. All species are illustrated in full color, including migrants and vagrants and visually distinctive subspecies. The text focuses on the field identification aspects of each species, including their behavior, vocalizations, and nest appearance. This is a companion volume to THE BIRDS OF ECUADOR: STATUS, DISTRIBUTION, AND TAXONOMY.